GANDHI, Mohandas. Original wood engraving by Fritz Eichenberg. 1942. Printed on India paper. 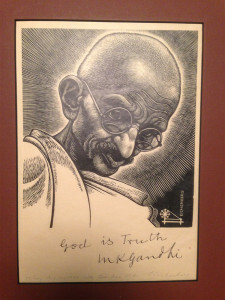 EXCEPTIONALLY INSCRIBED “GOD IS TRUTH” AND SIGNED IN INK BY GANDHI BENEATH THE PORTRAIT; additionally inscribed and presented in pencil by Eichenberg beneath Gandhi’s inscription. 12-1/2” x 9”. A TRULY BEAUTIFUL IMAGE OF GANDHI – perhaps the most famous graphic image of Gandhi in the West — the present appears to be a proof state of the woodblock in advance of its final engraved form (which included the words “Great Soul” superscribed above the portrait). 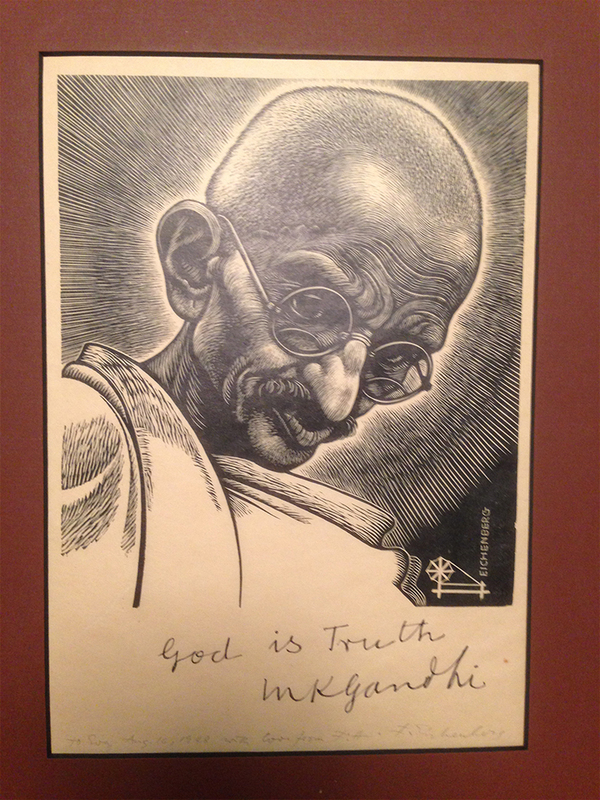 It has been Superbly Inscribed and Signed by Gandhi with the core tenet of his religious philosophy: “God is Truth.” Eichenberg’s inscription – dated August 16, 1948 – marks almost exactly the first anniversary of India’s liberation from the British. This image was originally created for “The Catholic Worker,” a Christian newspaper in the cause of social justice, and was subsequently used in multiple other publications. Signed copies of this superb image are of the Greatest Rarity.